Learning guitar JUST GOT EASIER! 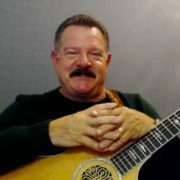 Because instead of having to choose from hundreds of boring “fluff” filled lessons, Gaylerd’s Beginner Guitar series will keep YOU excited about learning to play guitar with about 75 fun, step-by-step, bite-sized beginner tutorials. And since these lessons are streamed, you can stop, pause, repeat and review any part of a tutorial as often as you wish until you master the skill. This way, you can spend as much or as little time on each guitar concept as you need! Learn to Play Guitar in the comfort and convenience of your own home… or hut! My FUN, EXCITING and IN-DEPTH approach to teaching guitar is so easy-to-follow that even a caveman could have used my lessons to become a RockStar! It doesn’t matter if you are coming here to learn as an absolute beginner or just wanting to pick-up where you left off in the past. Because my step-by-step guitar lessons offer a fun, fast, and easy way to help you learn to play guitar. These easy-to-follow instructional videos provide clear and fun on-screen graphics and chord diagrams to help you build each guitar skill slowly, so your ready to move on to the next concept with ease. You’ll start with the very basic guitar fundamentals, all the way through to learning some cool beginner songs. A typical student can expect to get through the course in about 12 to 16 weeks. What is the Best Age to start to learn? There is NO UNIVERSAL “best age” to start learning how to play guitar. Young teens (12-15) seem to learn the fastest! They just get it! But there are lots of retired folks over 60 years young who are having fun learning to play using online lessons too. So I would say that as long as you have a desire to learn, are willing to spend time practicing, and are between the ages of 8 to 80… YOU’VE got what it takes to learn to play guitar! So what are you waiting for? Welcome Newbie! If you’ve been looking for an online beginner guitar series, you made it to the right place! Because it doesn’t matter if you have never even held a guitar before, or if you are coming here to pick up what you missed or refresh what you learned years ago. I’d like to think this series is the best choice for you! Because you can choose the lessons you need for wherever you are along your individual guitar journey. Below is a list of the lessons you will find in my beginner series. Before you actually start learning to the fun stuff about playing guitar, you really need to build your guitar playing foundation. Guitar 101 will help you get started by giving you the very basic fundamentals. These tutorials will teach you how to use your hands and fingers so you will be able to change chords smoothly. You’ll want to get these lessons down before moving on to 301. This is where you get into the FUN STUFF of playing guitar! You’ll learn how to form chords, exercises for changing them, and even how to play a few beginner songs. A Word to the Wise: I encourage you to check out my SPECIAL OFFERS page before deciding on a membership plan. You may be able to $AVE MONEY and get all of my GUITAR LESSONS and SONG TUTORIALS with a “Hall-PASS”. JOIN the e-Community Group for FREE! Subscribe to the GaylerdGUITAR™ e-Community for FREE!